Guitar Multi-Effects Units - Your Ultimate Guide from Andertons Music Co. The Multi-Effects board market has exploded in recent years. With major improvements in the sound quality and technology of digital effects systems,There's now a huge number of options to choose from. Whilst multi-effects have always been great for beginner guitarists on a budget, more and more professionals are turning to all-in-one systems for their live shows. When it comes to expanding your guitar rig, you have one big choice to make; Compact pedals, multi-effects or both? With compact pedals, many guitarists love the experience of building a pedalboard from scratch, choosing specific pedals that match their style for a massively cusomisable setup. Yet as you're reading this guide, i'm sure you've realised there can be many benefits to a multi-effects system! This comprehensive guide should hopefully give you all the information you'll ever need on multi-effects! We'll go through the different types of multi-effects and their features, so that you can find what is right for you. What Do You Need Multi-Effects For? when choosing any new guitar gear, it's always helpful to have a clear idea in your head what you're aiming to do, whether it's a particular sound or a practical issue you want to solve. While multi-effects units all look quite similar what they can do on the inside actually changes drastically depending on what you want them to do. Some units focus on effect modelling with a range of different overdrives, delays, reverbs and modulation effects. Others have built-in amplifier and cabinet modelling that can work on its own or with your clean amp. The idea behind these multi-effects units is that they work with your amplifier to create your sound. 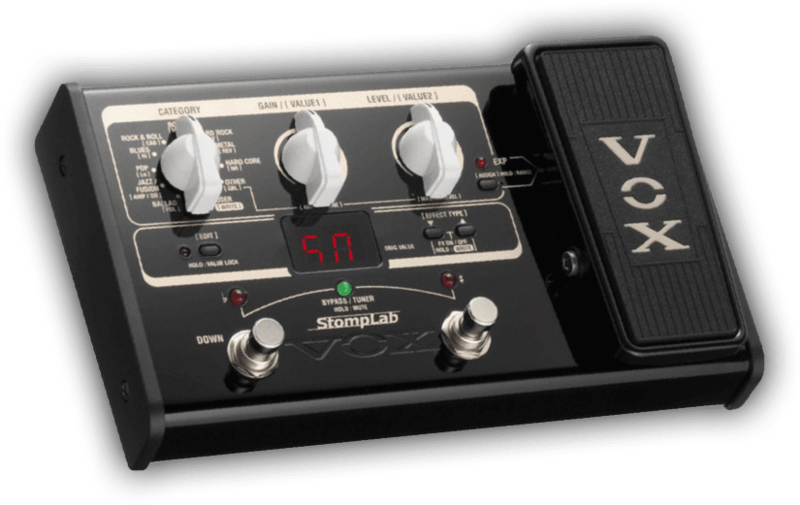 Normally they are focused more on stompbox and effects emulation rather than amp and cabinet simulations. The key to a good system like this is that it covers a wide range of effects and has enough footswitches for you to control everything on the fly. These are after all designed to be complete pedalboard replacements so you want to make sure you can control everything you need whenever you need to. Another thing you need to look at is connectivity. While a lot of multi-effects units work great just going in to the front end of your amp you might want to integrate it in to your effects loop as well. This is a real pain on more budget systems but when you get near the higher end, all of the connectivity options you need should be there. By utilising the effects loop as part of the ‘four cable method’ way of wiring you can then move effects like reverb and delay to after the amps gain stage which really helps with keeping your amps sound especially if you love the amps natural overdrive. So this is a really interesting point in the multi-effects world. You still want to use your amplifier but you want most of the tone (including amp modelling) to come from the multi-effects unit. Generally these units are entirely capable of being used on their own but as you still want a real amp on stage you decide to run it through that. The key to what makes these effects systems so good is a massive library of tone and effects options that can be easily controlled. The other thing is that the amp models need to have cab emulation that can be disabled or no cab emulation at all. This is because if you run cab emulation through an amp the sound is normally terrible. One of the big benefits of working like this is that it doesn’t matter what amp there is at your next gig. You can just rock up, plug in and away you go with just minimal tweaking to the EQ. Of course you can still take your amp with you but if most of your sound is on your pedalboard it probably won’t make too much of a difference. This is the final type of multi-effects unit. This is the system that you can use live, in the studio or for practice with no need for any other pedals or amplifier. You just plug in one end and your guitars final signal comes out of the other. This is something I have seen more and more in recent years as more musicians are performing fly dates across the world. By removing the amplifier from the setup you can just plug straight in to the PA or desk at any studio and get your tone no matter what. No longer do you have to worry about what gear the house band uses or what is available to loan as your entire rig may just fit in to your gigbag. The downside though is that if you want to get pro grade sound you will need to pay a fair amount of cash for your system. While pedals running through an amplifier have a bit of leeway as they are still running through a real guitar amp circuit. Digital rigs have little to no margin for error in tone, so you must get it right before you even step on the stage. But why does it cost so much? High quality digital circuits cost a lot of money and the amount of time that goes in to developing the sounds is monumental. This all adds up over time and means that the best systems can cost a lot of money but if you do want to go without an amp then these are the systems you need. So with that said what is the biggest differentiator between the different price brackets? Well here is a very rough rundown of what you can expect depending on how much cash you want to spend. The general idea is that quality and features get more advanced as price goes up. Less than £100: Minimal connections, great for beginners to learn about effects and start building their sound at home. £100-£250: Decent range of connections, live ready floorboard systems and home practice systems start to come into their own here. A perfect step up for players who want to play start playing live or just want better quality at home. £250-£500: All of the connections you will ever need, pro grade sound that can work equally well live, in the studio or at home. Pro grade tone with 90% of the features of top grade gear. > £500: Pro grade gear that is designed from scratch to provide every feature possible and the best tone. Prices can go as high as a few thousand pounds. OK so now you may have an idea of what you are looking for. Now it is just finding the option that is right for you. There are a lot of different details and features that are available across multi-effects units so let’s break a few of the most important ones down. This is one of the biggest things with multi-effects units. The whole concept is that you are replacing a very large and complex pedalboard or rig with a single system that does it all for you. So, if that unit is bigger than your current rig and requires loads of extra cable then what’s the point? Luckily a lot of multi-effects unit are small and very easy to take around but it is worth looking at it in comparison to what you could do with a bunch of compact pedals. Also are you looking to travel a lot? Do you want it to be small enough to fit in your pedalboard? Or do you want to carry it in a rack from gig to gig in a larger but still portable system? All multi-effects units will have your standard guitar in and amp out connections that are needed for it to run. Others however will have a bunch of different options like effects loops, amp control, line outs, simulated outputs, digital outs and much more. Generally the higher the price the more in-depth the connectivity, as integrating them can be quite expensive. Honestly, for most people that want something that falls in to the ‘pedalboard replacement’ category you will need just the basic inputs and possibly amp channel control. Everything over the top of that is mainly for those that want to use their system away from their amplifier and go directly into the PA or headphones. If you want to start getting most of your sound from the effects unit however you may be after something that offers a bit more in the way of connectivity. The most common addition to pedals like this is an effects loop that runs in to your amps effects loop. This is what is commonly called the four cable method and lets the effects unit place effects before and after the amplifier. The main benefit of connecting like this is that it lets you place effects after the guitars preamp stage which is where modulation and time based effects are normally at their best. If you want a complete amp replacement then you’ll instead be looking at something that has line outs that can run directly to the front of house or studio desk. These can come as either balanced ¼” outs or as XLR outputs, both of which carry the same high grade audio. Across the world of multi-effects pedals there are a bunch of different ways to digitally connect up your rigs. Some may offer extra control through external connections but others will work as audio interfaces so you can record in to your computer without any other hardware. USB is generally used for updating patches on the pedal using editing software on your computer OR Recording using the ins and outs of the unit. First let’s talk about updating patches. While nearly all units will give you pretty much all of the control you need at your feet or using the on-board controls sometimes using software is just faster. It may not be as convenient for on-the-fly editing but when developing your sound it can be a huge time saver. Generally systems that use this allow you to download presets from other artists and some even let you load your own impulse response cab responses to the unit. This is not true of all multi-effects pedals with USB ports however so it is worth checking the individual spec of the unit you are looking at. The other big use of USB is that you can easily connect up to the computer using the effects system as an audio interface. As these systems have to have incredibly high quality converters and processors anyway this actually makes them great options for interfaces if you are mainly recording guitar. Some systems will just allow you to record the effected guitar signal and that is it. Others on the other hand can be a lot smarter allowing you to record a DI with no effects and then feed it back through the device so you hear the effected tone but you record dry. The big benefit of this is that you can get your playing perfect first and then worry about the tone at a later date so you spend less time recording just to find out the tone doesn’t work with the rest of the mix. You will not see this lot on lower end systems but when you get nearer to the higher end you will find MIDI ports on a lot of these units. MIDI is extremely useful for controlling all of your effects and amp emulations either from a separate computer or a MIDI controller of some kind. The brilliant thing with this is that if you have decided to get a desktop or rackmount unit that can sit near your amp or at the back of the stage you can still control it remotely. No matter if that is programmed control set by your computer and the DAW or manual control on stage using a foot controller you can now use these systems live. S/PDIF is a commonly seen but rarely used connection for a lot of multi-effects users. You will find it on the back of a lot of gear and what it allows is for the audio to be sent digitally to your mixing desk or audio interface of choice. The benefit out of connecting like this is that if you have a high end premium interface with a stunning digital converter you can take full advantage of that in your sound. A lot of multi-effects systems do have great quality DACs (Digital Analogue Converters) but there is a fantastic extra level of quality available in audio interfaces designed for clean signal processing. It also stops you from having to convert from analogue to digital again say if you were going in via line inputs. Every step converting from analogue to digital degrades the sound so if you can keep it cleaner by running S/PDIF in to your audio interface when recording you will end up with better sound. There are so many effects units available today that it can be hard to find the right one. After all will one at £100 sound the same as a £200 one with just a few less features? Or do you really get what you pay for in the effects world? The answer is a little bit of both. Most multi-effects units sit in the range of £100 to £500 so there is a decent price range but nothing compared to what we see in the guitar or amp world. You really do get what you pay for in the world of multi-effects just like any point in the guitar world but there are limits. When you go up in price not only does the quality of the software generally go up but the quality of the hardware as well. Inside you have two core components that really make or break how these things sound; the processor and the converters. The processor is what makes all of the calculations and is what gives you the sound. At the lower-end this means that some of the effects will not have the same level of detail and in general it means you have fewer options as well. For example you may only be able to have two or three effects on a preset and you may not be able to change the order. On the next model up though you can have a lot more control and get all of the effects you need. Whether or not this is right for you entirely depends on where you are with your playing and what your needs are. If you are a beginner you do not need the most powerful system and the systems around £100 will have all of what you really need right out of the box so you can build your sound. If you are a more advanced player you will probably want more options that let you build your signal chain and dive deeper in to your effects. Inside any and all multi-effects systems you will have two converters. One that will convert your guitars analogue tone into a digital signal it can process and one that converts it back out to analogue so you can hear it at the other end. This is again something that gets better as you go up in price but for the most part you can get great conversion out of most of these units. They may not all be high enough quality for recording but for most day to day practicing scenarios all of them will stand up pretty well in terms of conversion. Of course like the processors you do end up getting what you pay for so the longer you have been playing and the more you are doing the more you may want to look at the higher end gear. The only real summary that can be made on this guide is that a lot of what is right for you is dependant on your needs as a player. If you are just starting out and want a great value way to get in to effects then the more basic options are an amazing choice. As you start to advance as a player though those extra options and cleaner tones will start to appeal.